Drive Medical Deluxe K.D. Aluminum Bath Bench without Back comes in an easy, snap together assembly. The blow molded bench, with drainage holes for reduced slipping, provides comfort, strength, and added safety. The aluminum frame is lightweight, durable and corrosion proof. Product is made from recycled materials. Easy Snap together assembly, Seat and Legs. Blow molded bench provides comfort and strength. Drainage holes in bench reduce slipping. Aluminum frame is lightweight, durable and corrosion proof. 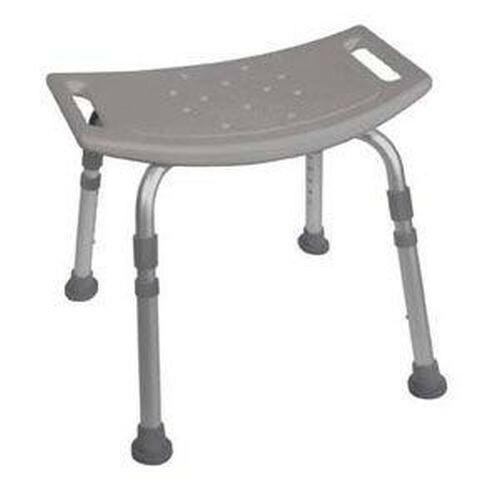 Height adjustable angled legs with suction style tips provide additional stability.